Not really what I was asking at all. I don't care about your opinions on the "merits" of playing on the Xbox vs. PC. I care, for people who have played both, if they notice differences in the gameplay itself. For example: Terrain tool is markedly better with the mouse for obvious reasons. I've also noted that the Box has a "rapid loot" ability that I can't seem to duplicate on the PC. Rovers seem to have a much better ability to tow trailers on the Box to name a few. Pretty sure I remember reading a fairly extensive "warning" that the game wasn't even in alpha stage of development and to only buy if you were ok with that. Not sure what you're even complaining about. Some people really have some great ideas... a lot of people have many of the SAME ideas. This is great. Means a lot of people kinda have the same thoughts about improvement, but I wonder how many people have actually even read up on the dev notes and road map. I see so many "suggestions" that are already defined on the dev's roadmap, kills me. 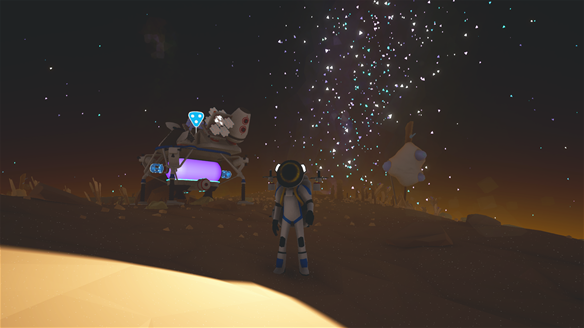 https://trello.com/b/UoZgKrd3/astroneer-road-map-planning I'm hoping if people have an idea where the dev's are headed with the game should help some people tailor their thoughts and hopefully generate more innovative ideas. The winch can be used to move shuttles out of and back into vehicle bays as well. It is variably useful, and likely will be much more useful later on. The drill/crane, exactly as stated. Harvests much more quickly if you build it on a truck with a storage expansion and little storage platforms. Build it on a truck chassis and tow with another truck. Astropack Accessory Ideas. 1. Jumpjets. Require power, very limited jump improvement. 1.25 jump ability perhaps? Likely just require one of the slots on the pack. Multiple units don't stack. (Don't want anyone flying away from the surface of the moon, with 10 jumpjets on their pack. =) 2. DDT/Agent Orange. Perhaps a setting on the terrain gun or a canister for the pack. Maybe native plant research should be required? An ability to obliterate foliage without modifying terrain. I despise all the extra growth that tends to build in and around my outposts. Hurts performance, and disrupts my "pretty" factor in my builds. Should destroy the organic resource harvesting ability as a liability. 3. Depth Gauge. Pretty self explanatory. Useful for spelunking some of the more complex and deeper cave networks where the layer colors are not obvious or noticeable. 4. GPS. This should probably be much more advanced. Perhaps requiring the building and launching of a satellite package, or even multiple satellites to activate. Not an actual module. Represented by simple coordinates on the HUD. 5. Wreckage Sensors. Indicator on HUD within an X proximity to wreckage/downed satellites. Part of a larger idea that certain "blueprints/technologies" should be split into categories. HAB/Rover/Outpost techs requiring human research items, Xeno technologies, ie., "filters, DDT, something to deal with those big sandworm bastards on the radiated planet" and finally perhaps an Exotic group for alien techs, rarest research finds etc. This obviously could expand into Xeno and Exo Research "sensors." Assuming of course the number of research nodes will be drastically reduced in coming expansions. It's pretty easy as is to just spelunk into even the first 2 depths and find a plethora of research. 6. Resource Sensors. Similar to above. Assumes resources will become much more difficult and sparse and perhaps even more numerous in variations. Expands into the concept of more diverse and exotic resources as well. Perhaps resources that ONLY come from various planets, etc. I'll build onto this series over time. Right now time to go eat leftover Christmas goodies and watch Martian, Interstellar and Gravity..... who am I kidding? You know damn well I'm going to go play more Astroneer.